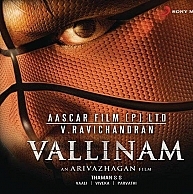 What happened to Arivazhagan’s Vallinam? It has been a long time since we heard from ‘Eeram’ fame Arivazhagan’s upcoming film, Vallinam. This sports drama has been produced by Aascar Films and stars Nakul, Mrudhula Baskar, Atul Kulkarni, Jagan and Anupama Kumar in the central roles. Meanwhile, the film is yet to be censored. S Thaman has delivered music and Bhaskaran has helmed the camera. Karthi gets 270 already ... How much will Ajith get !!! Superhit Telugu film comes to Tamil ! Arrambam might come earlier than Deepavali ! Prabhu in Little Superman ! When Is Viswaroopam 2, Veeram & Jilla Releasing? People looking for online information on Aascar Films, Arivazhagan, Eeram, Nagulan, Nakulan, Vallinam will find this news story useful.